Ritter Communications, headquartered in Jonesboro, AR, recently announced a partnership with NewWave Communications designed to offer both companies extended reach in telecommunications infrastructure. The partnership will provide both Ritter and NewWave the ability to provide new connections to customers with satellite, or parent sites, in both companies’ territories. Additionally, the relationship will allow for a quicker process of turning-up services to locations within the territories. 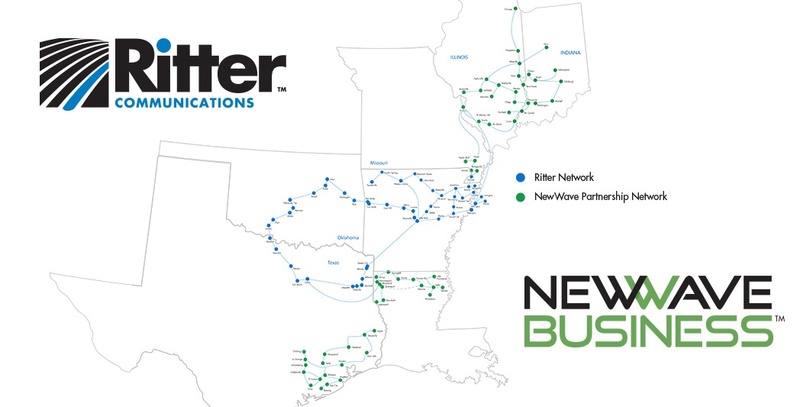 The partnership between Ritter and NewWave, which was made official earlier this year, will allow Ritter to continue expanding its ever-growing footprint across the state of Arkansas, and beyond. “The expanded reach, plus the ability to offer alternative communication solutions to businesses in the MidSouth and MidWest we feel is a real win-win for everyone,” said Kyle Alcorn, NewWave Communications VP of Commercial Services. Moreover, it will provide Ritter customers with better and new services in the future, as the company continues to establish successful partnerships with other communications providers. Ritter’s wholesale services offer resilient, secure and dependable network connectivity on Ritter’s state-of-the-art fiber backbone. With Ritter's unique combination of geographic coverage, reliable, high-quality bandwidth and ease of connectivity, wholesale customers can route across its network with confidence at prices that offer a real competitive advantage. To see a map showing the combined network footprint, please click here. You can also visit www.rittercommunications.com or www.newwavecom.com for more information. NewWave Communications is a broadband/cable company providing television, high speed internet, and digital telephone services for residential and business customers in Arkansas, Illinois, Indiana, Louisiana, Mississippi, Missouri and Texas. The company has a professional sales and support staff covering mostly mid to small sized communities offering an alternative to reaching remote sites and includes over 10,000 network mile and 3,000 fiber miles. NewWave is the 14th largest cable company in the country and continues to invest in commercial growth, its network and people.